In the years since the financial crisis of 2008, the free market has taken a beating in the marketplace of ideas. Yet the simple fact remains that the more economic freedom a government leaves in the hands of its people, the better off those people are, not only in terms of basic material well-being, but also in terms of social and individual indicators of human wellbeing. 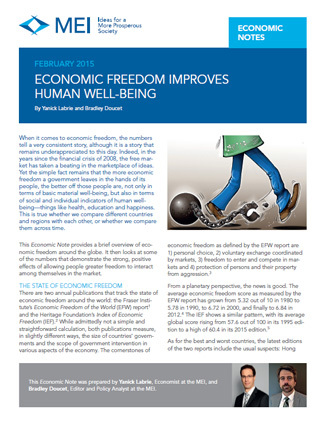 This Economic Note provides a brief overview of economic freedom around the globe. It then looks at some of the numbers that demonstrate the strong, positive effects of allowing people greater freedom to interact among themselves in the market. This Economic Note was prepared by Yanick Labrie, Economist at the MEI, and Bradley Doucet, Editor and Policy Analyst at the MEI. Comparing countries, it is clear that individuals living in places with more economic freedom tend to have substantially higher average incomes. The most economically free 25% of nations had an average per capita GDP of $39,899 in 2012, compared to $20,937 for the second freest quartile, $9,245 for the third freest quartile, and $6,253 for nations in the bottom quartile(9) (see Figure 1 on iedm.org). As for poverty, the share of income earned by the poorest ­10% of a country’s population is uncorrelated with economic freedom. The poorest 10% earn around 2.5% of GDP regardless of how free a country is. (11) Of course, given the strong positive correlation between economic freedom and per capita GDP discussed above, the poorest 10% who live in the freest countries are much better off in absolute terms. They enjoy average incomes of $11,610, compared to $3,929 for countries in the second freest quartile, $2,211 for the third freest and a mere $1,358 for the least free quartile(12) (see Figure 2 on iedm.org). Clearly, the poor living in a country with a decent amount of economic freedom are better off than those living in a country that is less free.